The same things that make springtime wonderful make it miserable for people with pollen allergies: flowers, grass, trees, breezes. When the weather warms and blossoms bloom, the world is alive with allergy triggers. If you struggle with spring allergies, it’s tempting to just stay indoors. But your indoor space might actually be worse for your allergies, depending on factors like your home’s air quality, proximity to allergen sources, and the state of your carpets and upholstery. What can you do? Actually, there’s a lot you can do to reduce the severity of pollen reactions. Here are some time-tested tips for surviving spring allergies. The local pollen count has become a commonly-tracked statistic, just like snowfalls and heatwaves. Your geographic zone has periods where pollen is more or less intense. So keep an eye on a local weather station for updates, or sign up for alerts about high pollen levels. In general, 5 a.m. to 10 a.m. tends to be the worst time for pollen movement, when the sun warms the ground, plants open for pollination, and morning breezes pick up. Avoiding time outdoors during those hours can help significantly. On spring mornings and when pollen counts are high, take a break from yard work. Gardening activities like weeding, raking, mowing, and trimming can create a blast of pollen that hovers in the air around you. If you must do yard work, consider wearing protective gear like a breathing mask or allergy-approved head net. Sure, they’re not the most fashionable accessories, but they’re quite effective. Even just snug sunglasses can help prevent pollen from getting into your eyes. Many allergy doctors recommend changing clothes as soon as you get home from your daily activities. When you remove clothes, put them straight into a box or bag that is sealed tightly enough to prevent pollen and dander from spreading throughout your home. This simple habit decreases the number of allergens that reach your personal areas like couches, beds, and linens. And remember – your shoes are also full of microscopic irritants, so you should probably store them outside your bedroom. It’s ideal to shower immediately after getting home, or at least before bed. This removes allergens from your body so they can’t settle into your bed. If you don’t have time for a full shower, wash your hands and face in the sink. Do you have pets or children? If so, it’s a good idea to include them in your pollen-busting plan. Children bring in all kinds of allergens on their clothing, shoes, and hair. Pets frequently carry pollen on their fur and paws. Evening baths are a big help. It’s also a good idea to limit exposure to pets and children who have just spent time outdoors in wooded areas. Many spring pollen sufferers get relief from using an indoor air conditioner. It might seem silly to flip on the A/C when spring breezes are still keeping things cool outside, but it does more than just cool things off. It does exactly what its name implies: conditions your air. As your A/C moves air through the house, it removes humidity – which holds pollen spores – and filters out all kinds of airborne particles. Check and change your air filter frequently to prevent buildup that can creep back into your house. For added protection, buy an A/C HEPA filter. 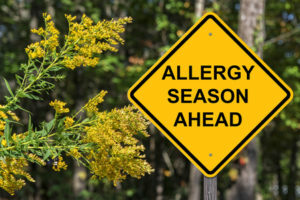 Over-the-counter antihistamines and inhaled sprays can offer relief, but allergy experts caution that some of these treatments aren’t intended for long-term use. Decongestant nasal sprays create a rebound effect, where allergies actually get worse after a few days of use. Talk to your doctor about your reaction to spring pollens and see an allergist if necessary. They may be able to offer allergy shots or prescription medications that are right for your situation. Did you know that some foods have natural antihistamine qualities, which can ease your reaction to pollens? Garlic, onions, apples, and citrus all fall into this category. Bee pollen and honey, gathered from sources in your area, are also thought to help manage allergies by stimulating your immune system to resist local threats. The effect of your office or home’s indoor air quality can’t be overstated. Even if you do all the things listed above, you’ll feel little relief when your indoor air is already contaminated with pollen and other pollutants. Anything that has fabric, including furniture and draperies, can hold pollen spores indefinitely. In fact, over time pollen and dander can build up to create nasty puffs of irritants as you move through your home. Regular upholstery cleanings keep them at bay. Carpet is another major source of allergens. All of the irritants in your home eventually give in to gravity and settle into your carpets and rugs. If you have allergies, carpet cleaning is a worthwhile investment in good air quality. As you seek cleaning services, make sure the company you use follows the latest environmental and allergy-friendly recommendations. A reputable company, like ServiceMaster, meets high safety standards and offers treatments that are free of volatile organic compounds (VOCs) and perfumes. Need help keeping your pollen allergies in check this spring? ServiceMaster can help pollen-proof your home, just like it does for hundreds of other happy customers. How Long do Bacteria and Viruses Survive Outside the Body?